A New Book Edited by J. Patrick Lewis! Students - It is always a thrill to be part of an anthology, and I could not be happier to share this new poem from this new book edited by J. Patrick Lewis and published by National Geographic Children's Books. 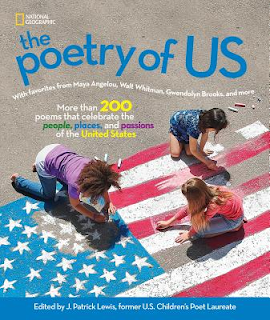 THE POETRY OF US: MORE THAN 200 POEMS THAT CELEBRATE THE PEOPLE, PLACES, AND PASSIONS OF THE UNITED STATES is a stunning volume full of poems old and new laid over spectacular photographs. If you are familiar with J. Patrick Lewis's NATIONAL GEOGRAPHIC BOOK OF ANIMAL POETRY or NATIONAL GEOGRAPHIC BOOK OF NATURE POETRY, this is the same gorgeousness. My poem takes the voice of a place, and I enjoyed imagining I was the Appalachian Trail itself. What secrets and wonders this trail witnesses, holding people on journeys both external and internal. If you do not know what to write about today, try making a list of places. Then choose one. Become it. Write. Did you know that writing in the voice of something else is called a persona poem...or a mask poem? Some of you a St. John's School in Houston, Texas might be wondering why I am not writing about the mouse. Well, sweet mouse will appear next week instead. As THE POETRY OF US celebrates its entry into the world this week, I decided to invite this poem to hike its way onto the blog today. Jone is hosting this week's Poetry Friday roundup at Deo Writer, where she shares Janet Wong's title poem from her new collection with Sylvia Vardell, GREAT MORNING: POEMS FOR SCHOOL LEADERS TO READ ALOUD. Each week we gather together, sharing poems, books, and poetry ideas all at one blog. All are always welcome to visit, comment, and post. "Hike me. Let me change you. Tell the Tale." Beautiful, Amy. We have a Colorado Trail here & it is a nice experience to walk even some of it. Your invitation should be posted on that trail! You make me want to get in my car and drive to the trailhead. The gift of moonrise....who wouldn't want that?! Gorgeous, moving poem Amy, love this line, "No bikes, no wheels. Just souls–unfettered, wild." Reminds me a bit of Carl Sandburg and Walt Whitman. I'm ready to jump right onto the trail. Congratulations and thanks for sharing your poem! Love that you gave the trail a voice! I love "all lives are equal...here." I am so grateful for your hand in getting my poem into this amazing collection, and then it led to whole book. Look what you started just by being you. I've hiked short bits of the AT, and it is magical and transformational if you let it. I love how your poem takes the persona of the trail itself. One day I'd love to hike all of it -- most likely in pieces rather than all at once. Congrats on your poem inclusion. You are forging a trail. This is lovely, Amy! My family took many hiking vacations on the AT when I was a kid, and this brought back all sorts of memories. Thank you!